Braised Tofu in a full flavored vegan sauce. 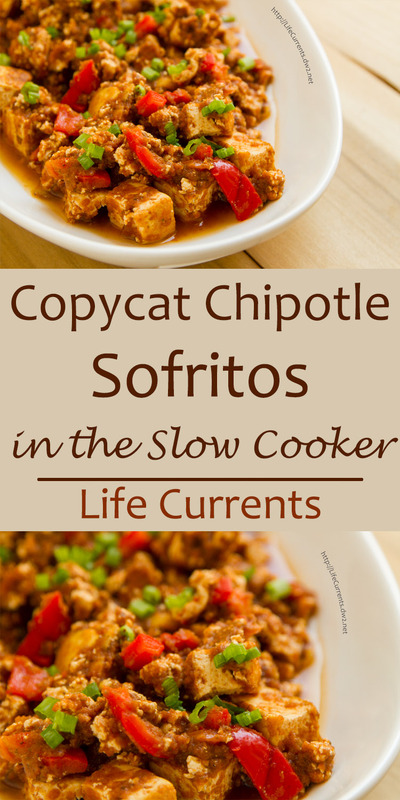 I give you: Copycat Chipotle Sofritos in the Slow Cooker or crock pot. This one is a keeper! I decided to try my hand at making a Copycat Chipotle Sofritos; I started at the source for inspiration. Chipotle gives all kinds of info on their Sofritos on their website. I took a couple of liberties, like I used red bell pepper instead of green because we like the flavor better. But I also used poblanos for a little spicy kick and a bit of that green color. And, mine is made in a crock pot or slow cooker. That makes it really easy to serve at a party – football party, tailgate, pool party, whatever – and you can have something tasty, vegan, and healthy at a party! Win win! We decided to make this Copycat Chipotle Sofritos to take to a party, and I’m so glad we made it! It was delicious! My version makes quite a bit because it’s for a large gathering, but it’s pretty easy to cut the recipe in half if you’d like. Also, I made mine on the less spicy/heat side. If you want more heat in yours, simply increase the amount of chipotle paste. I could even see going up to a tablespoon of chipotle paste for a nice spicy heat. But, increase the amount by a teaspoon each time and taste after stirring so that you don’t go too hot. Remember, you can always add more, but you can’t take it out. Serve these Copycat Chipotle Sofritos with all your favorite taco fixings! Guacamole, salsa, shredded lettuce, chopped cabbage, sour cream, cheese, whatever you like! These are also great for a party because they’re made in the crock pot or slow cooker. It stays nice and warm while you’re off having fun! The Chipotle Paste is something I always keep around in my kitchen. It’s really easy to make it yourself, and it’s a great time saver once it’s made. Find the instructions here. Roast the poblanos and the red peppers. I like to roast mine on the grill, outside. But I have detailed instructions here on how to do them on the stove top and in the oven as well. Layer your cutting board with a clean cotton towel and three layers of paper towels. Place tofu slices on top of the towels. Place a layer of three more paper towels on top of tofu, and cover with another cotton towel. Carefully place another cutting board or cookie sheet on top of the towels. Stack something heavy on top of the board, like a cast iron skillet, a large can of beans, heavy bowl or other weight to press down on tofu. Let sit for at least fifteen minutes, and up to one hour. While the tofu is pressed, roast the poblanos and the red peppers, until well charred and blackened. Allow to cool, peel, and remove seeds and membranes. Roughly chop all four peppers, setting one chopped red pepper aside and place the remaining 3 peppers in the bowl of a blender. Add the chopped onion, tomato paste, water, spices, salt, and chipotle paste to the bowl of the blender. Process until smooth. Pour the sauce into a crock pot. Heat 1 tablespoon oil in a large skillet. Working in batches, fry the tofu slices until golden brown. Cut tofu into cubes, and press of some of the cubes to shred the tofu. Add cooked tofu and the reserved chopped red pepper to the crock pot and stir to coat the tofu in the sauce. Cook tofu on low for 2-4 hours. Serve Copycat Chipotle Sofritos in tacos, burritos, bowls, tostadas, any way you like! Love your idea using tofu. I can’t wait to give it a try! Thanks. I love slow cooker recipes! I love Mexican food! You’ve hit a homerun with this one as far as I’m concerned!! This will be going on next week’s menu for certain. Invite me to your next gathering so I can try this! looks incredible, I love that you used red pepper, I like the flavor better as well. I love any and every slow cooker meal, I love Chipotle, and while I’ve never had Tofu before, I’m completely intrigued to try this and have a feeling I will love this too!! I think my family would love this! And the slow cooker definitely means that this would be great on a weeknight! Wow!! That is something completely new to me and I love how you made it. Tofu is tough to flavor but when done right, is a great item to add to your meals. This would be awesome for a quick weeknight dinner. My husband loves tofu, but I’m so inexperienced with making it, I never treat him to it. He has to wait until we’re at a restaurant! I think I’ll be changing that with this recipe! And I can do it in the slow cooker?! Double win! I posted on this last week but need to let you know that we tried this over the weekend and it was wonderful. Felt good in the tummy using tofu. As an added kick, we used some freshly cut corn from the cob that we had purchased at the farmers market. YUMMMMM! Thanks. Dan, that’s awesome to hear! Thanks so much for taking the time to let me know you made it! I like the idea of adding corn as well! That would be delish! I love tofu and chipotle sofritos are a real favorite. This recipe looks delicious! Great flavors here! I can eat this all day! I can’t wait to try this! Chipotle sofrita bowls are one of my favorite things but I’m trying to cut down on expenses this year. Do you think this would freeze well broken down into smaller portions? I’d love to cook a big batch ahead of time and save some for later use. Thanks! Elizabeth, I’ve frozen tofu before and it works fine. It changes the texture a little and some extra water comes out when it’s defrosted, but you could drain off a little of the water if you need to. Otherwise, I think it’ll be great after thawing. Mine isn’t quite as spicy as theirs, so you may want to add a little more heat. Sofritos bowls are one of my favs too! Thanks for stopping by! Sounds great! I’ll give it a try. Thanks, Debi.